SiteGround vs. iPage Comparison (2019) - 1 Clear Winner! Home » Hosting Reviews » Hosting Comparisons » SiteGround vs. iPage Comparison (2019) – 1 Clear Winner! Are you looking for the best cheap hosting service? iPage and SiteGround are 2 of the most popular web hosting services available on the market. But which is truly the best choice: iPage or SiteGround? Choosing the wrong web hosting provider could hurt your search rankings and business. And that’s why we’ve written an UNBIASED web hosting comparison between iPage and SiteGround, so you can decide which one is the best option for your site. SiteGround is an officially recommended web hosting provider on the market. They offer one of the best 24/7 support in the industry and maintain a high level of customer satisfaction. Their hosting options run the gamut from cheap hosting all the way up to dedicated hosting servers. With their WordPress hosting service, they provide automatic WordPress upgrades, built-in WP caching, CDN, one-click staging and GIT version control. They are one of the few companies that let you choose your preferred data center when signing up for a hosting service. Their data centers are located in USA, Europe, and Singapore. iPage is a hosting brand owned by Endurance International Group. They’re well-known for their affordable hosting options, starting from as low as $1.99 per month. iPage was founded in 1998, which now serves over one million websites from across the globe. Just like SiteGround, they also provide a range of hosting options, including shared, WordPress, VPS, and Dedicated hosting. iPage is an EPA green power partner, which means their data centers are powered by wind energy, reducing carbon footprint to a great extent. Page speed and uptime are the most important factors that you need to consider while choosing a web hosting service. According to studies, even a 1-second delay can result in a 7% reduction in conversions. Plus, Google continues to emphasize page speed in their algorithm. Not to mention, if you’re not taking page speed seriously, you’ll likely lose SEO rankings and your customers will abandon your site. Uptime is important because your visitors expect your site to be available around the clock. Uptime is usually expressed as a percentage of the total available time, such as 99.9%. Often, web hosting providers boast about being the fastest web host and promise high availability with their hosting services. To test whether they live up to their hype, we signed up with both SiteGround and iPage and created a test WordPress site on each of them. We also installed a default theme, added dummy content, and uploaded some images to mirror a live environment on our test sites. Then we conducted a few different speed and uptime tests on them. According to the Pingdom test, our SiteGround test site took only 649 ms to load when tested from Dallas, Texas. That’s faster than 95% of all tested sites. When we ran the same test on iPage; our test site took 2.6 seconds to load. Aside from our Pingdom test, we also used a testing tool called Load Impact to figure out how SiteGround would handle server requests during a traffic surge. To test it, Load Impact sent some virtual users (VUs) to our site and gradually built up to 100 visitors at a time. As you can see, there are a few spikes in the loading time graph. This is quite common in a shared hosting environment. However, our site never went down during the test. Our iPage site has slowed down when there were 50 users. The site quickly recovered in a few moments and page load time remained steadily low even with more users. It’s worth noting that the site never went down during our speed test. They also offer dozens of one-click installer for popular website scripts such as WordPress, Joomla, and Drupal. Now let’s take a look at iPage and how easy it’s to manage a website on their platform. All iPage hosting packages come bundled with an easy-to-use website drag and drop builder and a 1-click WordPress installer. 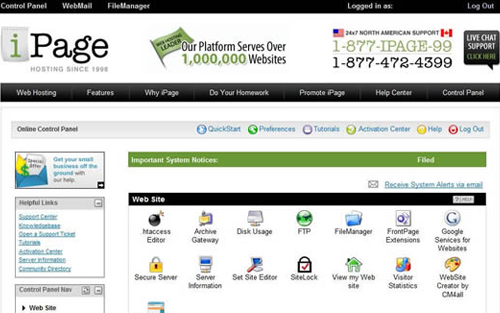 The main downside is that iPage doesn’t offer cPanel. Instead, they offer their own customized version of a control panel which they refer to as vDeck. However, if you’re accustomed to cPanel, which is the most popular web hosting control panel, then there’ll be a bit of learning curve to tackle before using vDeck. Both SiteGround and iPage are likely to have the right hosting option for your website, regardless of the size and budget of your online business. While SiteGround focuses on providing blazing fast hosting experience with industry-leading speed technologies, iPage gives you all the entry-level features for beginners to easily kick off a site. Let’s take a look at a few areas where iPage stands out the competition. Unlimited websites: iPage only offers 1 cheap hosting plan. You can host unlimited websites with that plan without an extra cost, whereas SiteGround requires you to sign up for a slightly expensive plan for unlimited sites hosting. Drag and drop site builder: While iPage provides an in-house developed site builder, SiteGround offers Wix builder with every web hosting plan. Free ad credits: Get free ad credits worth $200 with every iPage web hosting plan. Now that we know the benefits of iPage, let’s take a look at a few areas where SiteGround excels in comparison to iPage. Speed technologies: SiteGround offers CloudFlare CDN with every web hosting plan. You can also boost your load time with SuperCacher with a slightly expensive plan. Backup and restores: With every plan, you get free daily backup, and with a slightly expensive plan, you can avail free site transfers and backup restores. Geeky features: If you need geeky advanced features such as PCI compliant servers and 1-click Git repo creation on your shared web hosting, you can subscribe to their GoGeek plan. Both SiteGround and iPage offer 24/7 support via phone, email, and live chat. You can also count on their knowledge bases, which cover every aspect of building a website from the ground up using their web hosting plans. Without a doubt, iPage’s hosting options are way cheaper than that of SiteGround. iPage offers a one-size-fit-for-all plan for cheap hosting. They provide only one cheap hosting plan, which costs only $1.99 per month, whereas SiteGround’s cheap hosting plan starts at $3.95 per month. SiteGround doesn’t offer VPS hosting plans. However, they do offer cloud and reseller hosting. Here’s a detailed comparison between the pricing of different hosting options from SiteGround and iPage. iPage $1.99 /mo. $3.75 /mo. $19.99 / mo. $119.99 / mo. SiteGround focuses on providing super fast hosting experience to customers. They’re one of the few shared hosting companies that let customers choose their preferred data centers while signing up for a hosting plan. 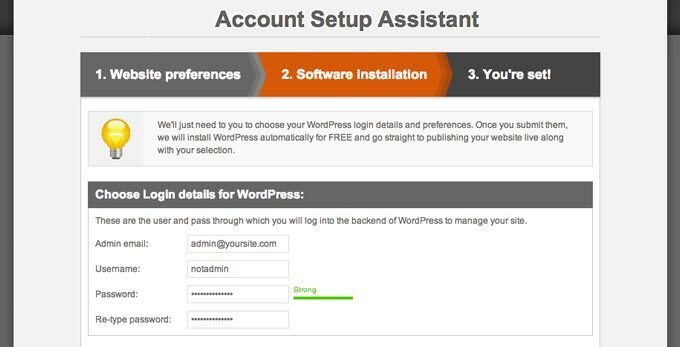 As a recommended WordPress hosting provider, they offer managed WordPress hosting as well as WooComerce hosting. iPage, on the other hand, provides affordable hosting options for websites of all sizes and budget. If you’re already hosted on another hosting provider, you can avail a free website transfer. Best of all, their free site builder lets you create a beautiful site with ease. We hope this article helped you find the best web hosting services on the market. If you liked this article, check out our SiteGround review and iPage review.